Board of Directors Meeting of Co-operative Housing International – Salon des Glaces des Versailles, L’Hôtel de France des Versailles, 5, rue Colbert, Versailles, France on July 2 at 10 am. Please note that we have included a “round table” item on the agenda, to give directors an opportunity to speak briefly on emerging co-operative housing issues and challenges in your home countries. The next meeting of the Co-operative Housing International Board takes place in conjunction with the CECODHAS/l’Union Sociale pour l’Habitat Conference – The City of Tomorrow and the role of affordable & social housing providers. Any CHI board members wanting to attend the CECODHAS conference will need to register as soon as possible and MUST check their visa requirements well in advance. The first part of the event will be dedicated to the role of social and affordable housing providers within the urban context to better understand the challenges that cities of tomorrow will be facing. Between new constructions and refurbishment plans, how urban areas must adapt to be accessible, sustainable and in line with the new lifestyles? What are the new responses and solutions that the social housing sector should give? 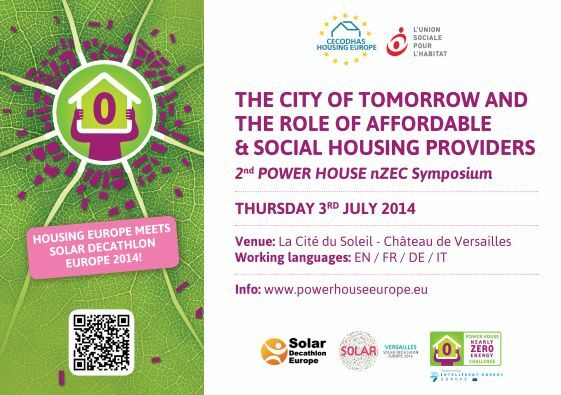 The second part of the day will be focusing on the work carried out by the POWER HOUSE nearly-Zero TaskForces and to CECODHAS Housing Europe Award ceremony. Beside the official award issued by the SDE2014 Committee, a Team of Jurors coordinated by CECODHAS Housing Europe, composed by high-level Social Housing Experts including Directors of both National Federations and Local Housing Companies, Technical & Building Physics Experts and Specialists in Housing Regeneration Programmes, Fuel Poverty and innovative approaches to working with low income and vulnerable households, will award the “CECODHAS Housing Europe Award – For a Fair Energy Transition in the EU”. This award will be based on usability and affordability (both in the construction and use-phase) criteria from the perspective of the residents and the providers. This mix of Jurors’ skills and competences will assure that the evaluation of the proposed projects will be made from different angles and therefore that usability and affordability criteria from the perspective of the residents and the providers will be reflected in the jury’s choice.